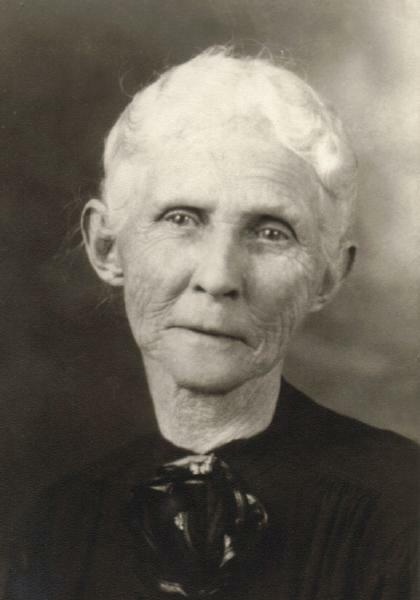 Anna Mary Pegues was born on 25 September 1859 in Alabama. James Bartholomew Pegues and Ann Eliza Brodnax appeared in the US federal census of 1 June 1860 in Linden PO, Marengo County, Alabama. Other members of the household included Anna Mary Pegues, Sarah Pegues. James Bartholomew Pegues and Ann Eliza Brodnax appeared in the 1866 Alabama state census in Dallas County, Alabama. Other (counted but unnamed) members of the household apparently included Anna Mary Pegues, Sarah A. Pegues, Rebecca M. Pegues and James Bartholomew Pegues. James Bartholomew Pegues and Ann Eliza Brodnax appeared in the US federal census of 1 June 1870 in Spring Hill, Marengo County, Alabama. Other members of the household included Anna Mary Pegues, Sarah A. Pegues, Rebecca M. Pegues, Decima H. Pegues, Thomas Pegues and Edward Hartley Pegues. James Bartholomew Pegues and Ann Eliza Brodnax appeared in the US federal census of 1 June 1880 in Faunsdale, Marengo County, Alabama. Other members of the household included Anna Mary Pegues, Rebecca M. Pegues, Decima H. Pegues, Thomas Pegues, Edward Hartley Pegues, Christopher Curtis Pegues, Jessie Fletcher Pegues and Sarah A. Pegues. She and James Anthony Torbert obtained a marriage license on 11 December 1880 at Marengo County Probate Court, Marengo County, Alabama, with James A. Torbert and Thos J. Torbert serving as bondsmen. She married James Anthony Torbert, son of Thomas Jefferson Torbert and Rebecca Priscilla Sledge, on 15 December 1880 at Faunsdale, Marengo County, Alabama. James Anthony Torbert and Anna Mary Pegues appeared in the US federal census of 1 June 1900 in Jackson's Store Precinct, Marengo County, Alabama. Other members of the household included Sidney Ernest Torbert, Florence Edna Torbert, Thomas Jefferson Torbert, Sarah Decima Torbert, James Everett Torbert, Rebecca Pegues Torbert, George Whitfield Torbert, Sylvester Sledge Torbert and James Bartholomew Pegues. I know you thought I had entirely forgotten my promise to send you my picture; but you were mistaken. Grandpa seldom forgets a promise made to anyone and especially does he remember one made to his dear little children. I am sometimes slow in fulfilling my promises; but as soon as I can I always try to do it so you must forgive me for being so long about it. I send you my picture in this letter. Deccie & the boys Kit & Fletch say it is a good one, I don’t know whether it is or not myself. If I ever have the money to spare I am going to have some photographs taken and send some of you one of those. I had this picture taken for you alone. I want to see you all so bad. It seems like a year since I left home. I can’t tell now when I will come back home. Work is scarce here just now and hard to get so money is scarce with me. I would give a lot to see my & Dutchman, and in fact all of you. Tell my Dutchman that I will be sure to bring him a lot of nails when I come and tell Whitfield I have not forgotten his hatchet, and that it shall be a steel one that will not break so easy. I suppose you all go to school now to Miss Bertie Small, Do you like her. I hope my dear little Jimmie is well and finally rid of his chills. Tell your mama to open my box of scaley barks and take half of them out for you all if you want them, and if she can to sell the other half for me and pay Mr. Lowry the 30c I owe him and if she get more than 30c for them to buy her some postage stamps with the rest. I don’t know if she can sell them or not, or what they are worth. Kiss mama, the baby, my Dutchman, and Whitfield for me and give my love to all the rest. Now my dear little girl I must close. Deccie & the boys send love to all. Tell old man Isac howdy for me when you see him. Write to me when you can. A photographic portrait was made of James and Anna Pegues Torbert and children (except older brothers Sidney Ernest and Thomas Jefferson), about 1903. James Anthony Torbert and Anna Mary Pegues appeared in the US federal census of 15 April 1910 in Jackson Store, Marengo County, Alabama. Other members of the household included Sarah Decima Torbert, Rebecca Pegues Torbert, George Whitfield Torbert, Sylvester Sledge Torbert and Elise Louise Torbert. She witnessed the marriage of Louise Beall Adams and James Everett Torbert on 6 June 1914 in Faunsdale, Marengo County, Alabama, at the Rectory of St. Michael's; with Rector J. J. Harriss officiating. In 12 September 1918, Anna Mary Pegues and James Anthony Torbert were living in Gallion, Marengo County, Alabama, according to son Sylvester's WWI draft registration. James Anthony Torbert and Anna Mary Pegues appeared in the US federal census of 1 January 1920 in Jackson Store, Marengo County, Alabama. Other members of the household included Sylvester Sledge Torbert. Elise Louise Torbert and James Rhodes Speed appeared in the US federal census of 1 April 1940 in Jefferson, Marengo County, Alabama, at Jefferson-Linden Road. Other members of the household included Anna Mary Pegues, Carl Anthony Speed. Also in the household was James' mother's sister Daisy Terry, age 66. 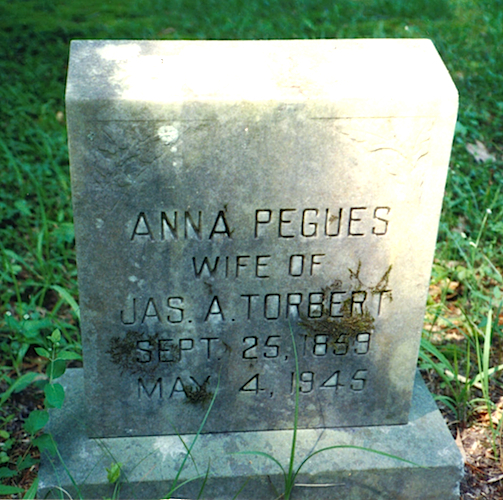 Anna Mary Pegues died on 4 May 1945 at age 85 in Old Spring Hill, Marengo County, Alabama. She was interred at Old Spring Hill Methodist Cemetery, Old Spring Hill, Marengo County, Alabama. The following appeared in a local newspaper: Funeral services were held at the Old Spring Hill Methodist Church at three o'clock Saturday afternoon for Mrs. Anna Pegues Torbert, 86, who died after a lengthy illness at the home of her daughter, Mrs. J. R. Speed, in Jefferson, Friday morning. The Rev. T. W. Ward of Coatopa officiated. Interment was in Spring Hill Cemetery with Dodd-O'Neal Funeral Home directing. Pallbearers were C. B. Grant, Caldwell Allen, Jim Norris, Teddy Vaughan, J. C. Vaughan and Roy Hartzell. Mrs. Torbert was born in Old Spring Hill, the daughter of James B. and Anna Broadnax Pegues. She was married to James A. Torbert and to them ten children were born, eight of whom are living. They made their home in Old Spring Hill. Surviving are S. E. Torbert of Thomaston, Mrs. E. W. Clements of Gladewater, Texas, J. E Torbert of Demopolis, Mrs W. A. Ballow of Sylacauga, G. W. Torbert of Linden, S. S. Torbert of Faunsdale, and Mrs. J. R. Speed of Jefferson. Other survivors include twenty-three grandchildren and twenty-one great-grandchildren. Mrs. Torbert had a wonderful outlook on life. She never got old. She was a friend to all with whom she came in contact and was ever ready to lend a helping hand. Her bright disposition was an inspiration to us all.